This federal funding helps Nurse-Family Partnership change outcomes for more expectant moms and babies. The Maternal, Infant and Early Childhood Home Visiting (MIECHV) program is a federal program that has had longstanding bipartisan support in Congress and in states. Created by Congress in 2010, the MIECHV program provides $400 million in grants to states to implement evidence-based programs such as Nurse-Family Partnership. While investments in home visiting have existed for some time at the state level, MIECHV has driven states to invest in those models with demonstrated positive outcomes for at-risk families, and it allows states to determine which models best meet their needs. Seventy-five percent of funds must be used for programs that are evidence-based, leaving up to 25 percent for promising programs. Nurse-Family Partnership has met all of the benchmarks required under this innovative federal program. A recent report showed that over 79 percent of Nurse-Family Partnership clients funded under the Maternal, Infant and Early Childhood Home Visiting Program received prenatal care during their first trimester, and over 31 percent of clients without a high school diploma or General Educational Development certificate achieved that goal by the time the infant was 12 months old. 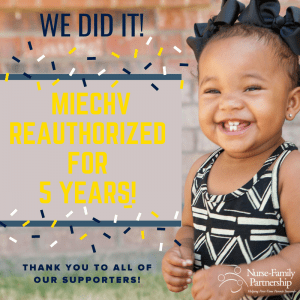 MIECHV Update: Thanks to our collective efforts, we can all celebrate a huge victory with the passage of a 5-year reauthorization of the Maternal, Infant, and Early Childhood Home Visiting (MIECHV) program! Click here to read the NFP National Service Office’s press release regarding the legislation. Please feel free to thank your Members of Congress for their support for the MIECHV program. We have provided a suggested thank you here. We encourage you to personalize your letter(s) to include details and information about how NFP and MIECHV impact your community.